Rego Pass + Workshop Passes will be available around July 2019. The program will begin construction approximately July as well. These will be held during the event from Sept 25 through to Oct 2. More details on teachers and classes available mid year 2019. Included in your Wristband cost, no sign up or online payment required. All Hip Hop Solos and Crews/Groups will be under the newly rebranded “Upgrade” Hip Hop day/night. The exact same as we normally do a hip hop day/night at GTB Finals, except run by hip hop professionals and external judges furthering your hip hop experience. Your entries will be automatically in the Upgrade event – you do not need to do anything different with registration. 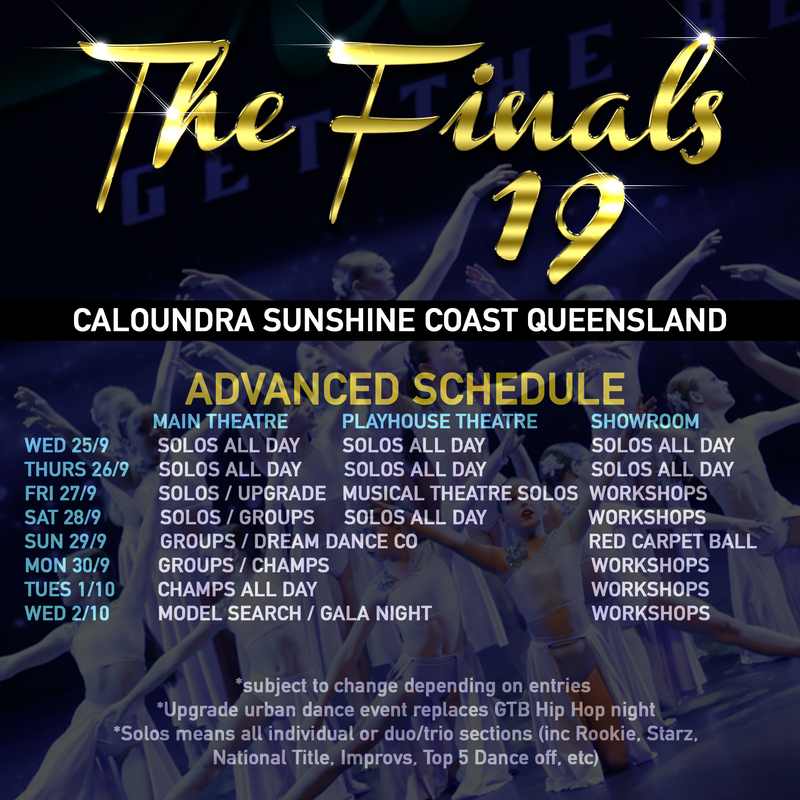 Studio Owners can collect there studio packs at the GTB Desk at Finals for all studios competing in Groups at the event, this includes your program, teacher VIP passes and other goodies. ALL ACTS must upload music based on their competing numbers. We will not accept any CDs at Finals anymore. Backups are essential on USB only. 30-60 mins prior to day commencement on each day. This will be added to your dropbox files that will be sent out closer to the event. We have several areas of change space for this event and it will change day to day, please see staff for help. FOYER AREA – SHOES ON! There is a bar area close to the front foyer – which means SHOES ON for all dancers in this area – this is basic safety and health as Bars contain glass and glass can break causing kids to step on it and then off to hospital you go! – just pack slippers or those boot thingys to slip over feet when in this area! Dancers with rego passes can view any action on the stages (except Gala night and when we are full – the main theatre holds 900+ people, if that fills we may ask dancers to leave to accommodate for paying parents). All viewing tickets can be purchased at the box office. This event is for Champion of Champion dancers and their families. The Champs kids will all gather in the hallway while the parents and supporters go into the showroom seating area, the room will accommodate around 200 seats, any extras will need to stand to watch. The champs kids then all walk the red carpet down the stage to their area, and after that we will call some judges on stage to chat to and finally groups of champs kids to draw their running order for Champs day. Its really fun and a great event that leads into the main theatre for the Dream Dance co that night. Minis, Petites and Pre Juniors are at 4.30-6.00, and Juniors, Teens and Seniors are 6.30-7.30. Filming/Photography is welcomed at this event. If 2018 is to go on, this event will be just as amazing with the full cast plus our GTB Teen and Senior winners from regionals. The night of nights for the GTB year. All top 5 soloists from all 7 age groups plus all the highest achieving group acts, in some age groups there are just 8 acts from over 100 selected. A judges panel of 6 will determine the winners! Special Guests, GTB Awards winners, plus so much more.